CINCINNATI -- A prosecution expert testified Thursday that he saw no evidence that convicted killer Anthony Kirkland has a traumatic brain injury, but he also conceded he couldn’t rule it out. Dr. Alan Waxman, Director of Nuclear Medicine at Cedars-Sinai Medical Center, testified at Kirkland’s resentencing hearing that he found no abnormalities in Kirkland’s PET brain scans conducted at Ohio State University last October. 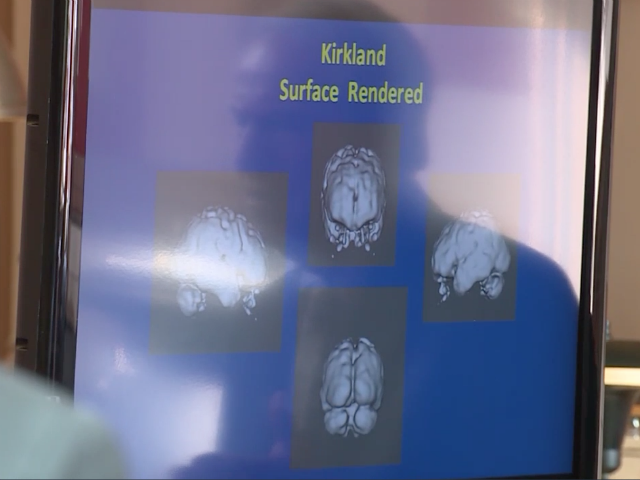 Dr. Alan Waxman's reflection shows in the screen as he displays Anthony Kirkland's brain scans to the jury during Kirkland's resentencing hearing. The prosecution called Waxman to challenge defense testimony by Dr. Joseph Wu, who said Wednesday he concluded from the same tests that Kirkland has a traumatic brain injury. The defense is trying to convince the jury that a brain injury might have led to the same condition found in some NFL players - chronic traumatic encephalopathy, or CTE – and that it was a mitigating factor in Kirkland murdering five women. Wu said Kirkland’s brain showed severe neglect and abuse and crippled Kirkland's decision-making. The defense is hoping to show mitigating circumstances so the jury will not sentence Kirkland to the death penalty. Using Powerpoint, Waxman showed the jury PET scans of Kirkland’s brain. “You should be able to see abnormalities in the brain" (with a traumatic injury), Waxman said. “I didn’t see that in Mr. Kirkland. His brain looked really good. 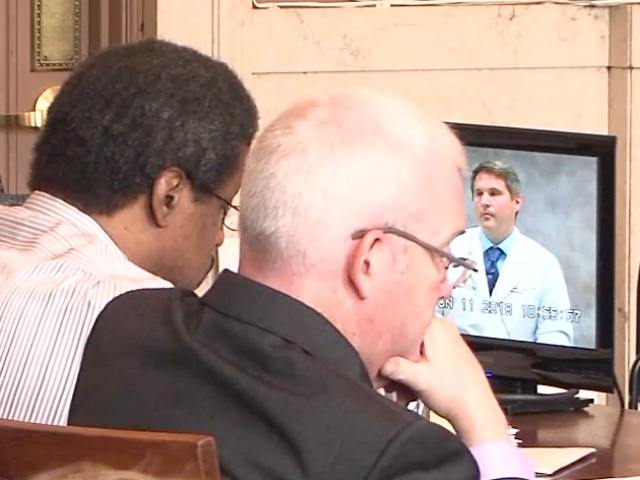 Anthony Kirkland (left) watches Dr. Daniel Boulter’s video deposition. Waxman, who described himself as an expert In nuclear medicine and not radiology, testified that he is well versed in reading PET scans but not in MRI or SPM scans. He also conceded that PET was not recommended by the American Medical Association for looking for head trauma. Under cross examination, defense attorney Tim Cutcher proposed this to Waxman: “We agree that there’s no way to rule out traumatic brain injury by way of a PET scan" and Waxman concurred. Waxman challenged Wu’s methodology as “very strange” and said Wu’s approach is to claim brain injury but not explain “from what.” Waxman said Wu does not consider normal variations in the brain when reaching his conclusions. Later, the prosecution presented a video deposition by Dr. Daniel Boulter from Ohio State’s Wexler Medical Center to try to reinforce Waxman’s testimony. Kirkland was sentenced to death in 2010 for the murders of 13-year-old Esme Kenney and 14-year-old Casonya Crawford. But on appeal, the Ohio Supreme Court ruled that prosecutor Joe Deters made an inappropriate remark to the jury during closing arguments and ordered a resentencing hearing. More testimony is scheduled for Friday. The jury could get the case on Monday.